A friend lent me his set of Kenko extension tubes to try out so I stuck my 50mm f/1.8 on them and took a few shots of this pot plant on our kitchen windowsill. Some practice is needed but the result certainly seems better than I’ve achieved with close-up filters. I’ve yet to try them with my 70-300 lens to see what kinds of insane magnification I can achieve. The flower in this shot is no more than 1cm across. 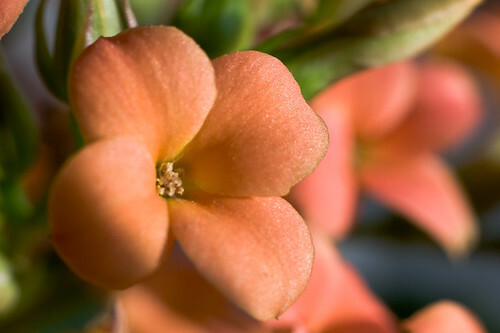 This entry was posted in Photos and tagged Flowers, Kalenchoe, Macro, Orange. Bookmark the permalink.